This issue of Preventing Chronic Disease highlights health communications. With the emergence of “Web 2.0,” one of the common approaches to health communications is connectivity through networks. In a communications network, new technologies allow for interactive information sharing, interoperability, and collaboration through the use of Web-based communities, hosted services, Web applications, social networking sites, video-sharing sites, wikis, and blogs. Any network, regardless of its size or intricacy, depends on the interactions of the smallest veins. 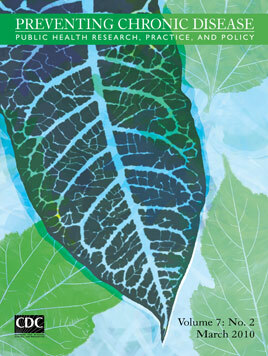 To represent this idea, the cover art for this issue is a leaf, a natural network. Although it appears to be a simple object on the surface, it could not exist without the intricate network of veins that keep it healthy. When all of the pathways are open and functioning, the plant thrives, and the pathways can support not just that one leaf but a large network of leaves that nourish the plant as a whole. If any part of the network is compromised and cannot function properly, the leaves are at risk and the plant could wither.